Continental's paper binders can offer an inexpensive way to get information out to your customers. With Combine a wide variety of decoration to display your logo in just the right light. Add lamination to provide strength and protect your image. Emboss/Deboss registered with imprint color. 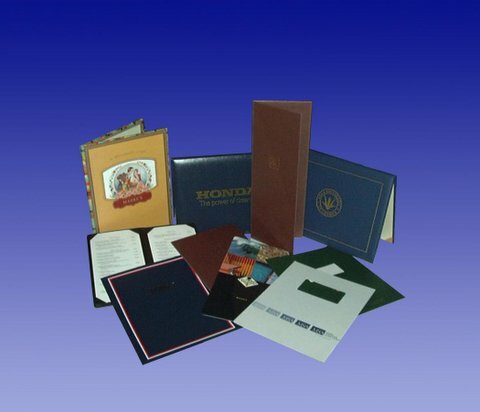 Continental offers many types of custom paper covers for all of your binding needs. Our one and two piece custom covers are perfect for a variety of binding operations. They work well with brads, prong fasteners, and screw posts as well as comb, spiral, and wire o operation options and add a window to let important information show through. Make your breakfast, lunch, and dinner selections stand out with one of our beautiful and versatile covers. Design custom covers for for wine list and specials. Secure your menu with an elastic or tassel cord or have us include corners to hold your menu. Create a lasting keepsake and protect important awards by presenting them in a custom diploma or certificate holders. Using paper and turned edge products we can help you make your award or diploma presentation even more memorable.